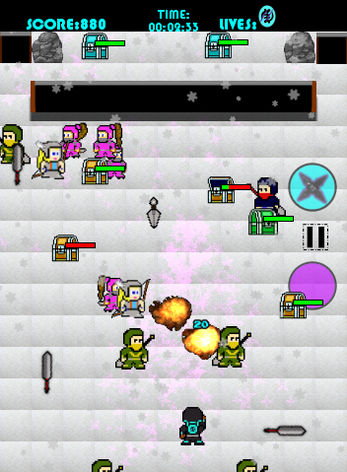 Finally, the Remixed and Fixed version of the Hit Mobile Game App is Here! 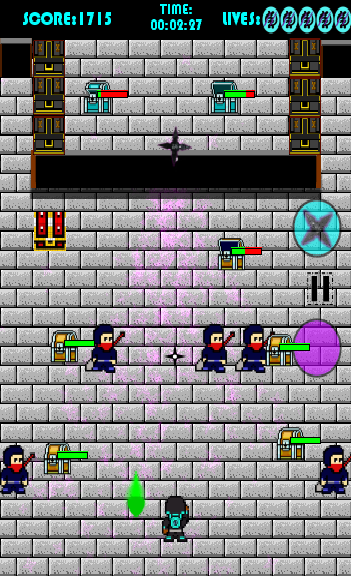 Trap Dat Ninja: REMIX is the long awaited update to PIOSystem's 1st Game, 'Trap Dat Ninja'. With new Enemies, Characters, Intro Cinematic and Unlockable Weapons, Trap Dat Ninja: REMIX improves on the Bullet/Ninja Hell Shooter experience in so many ways! Thanks for playing and remember to TRAP DAT NINJA! NOTE: The online/HTML version of Trap Dat Ninja: REMIX this page isn't formatted to play on Mobile Browsers properly; Only on Desktop/Laptop Computers. If you like to play for FREE on Mobile (Google/Android), please download the Mobile App at the Google Play Store! 11/11/17 - Version 1.01: The original Upload of TdatN:REMIX. Had a few bugs within the game, so I had to take it down and fix them. 12/3/17 - Version 1.02: Fixed a few things, Still working on the icons for the Weapon Select. It shows all weapons unlocked, but they are not and still need to reach score point levels to unlock them. 2/11/18 - Version 1.03: Now the FREE/Html5 version is available to play online! Try out Trap Dat Ninja: REMIX, and if you like it, buy and download it! Also, there are a few bugs with the in-game Pointer/Cursor not syncing up; will be fixed soon! 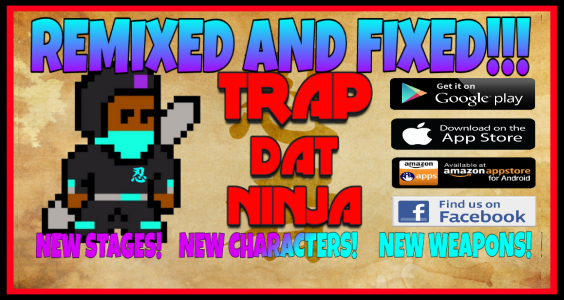 3/14/18 - Trap Dat Ninja: REMIX is now available on the Android/Google Play App Store! So please download and play the Updated version for a better gaming experience! 4/11/18 - Version 1.04: Made some adjustments to one of the Damsel's Callouts; Also corrected 'Final Mission' stage layouts. Altered 'How To Play' instructions for Desktop/HtmL5 versions of the Game, and Adjusted 'Weapon Unlock' score Values. Fixed GyeNyame Cursor; Now Syncing with Mouse Pointer. Now Available on Windows/PC, Amazon App Store and Google Play/Android App Store! Coming Soon to Apple/iTunes App Store, Mac/Apple OS and other formats, so be on the Lookout! 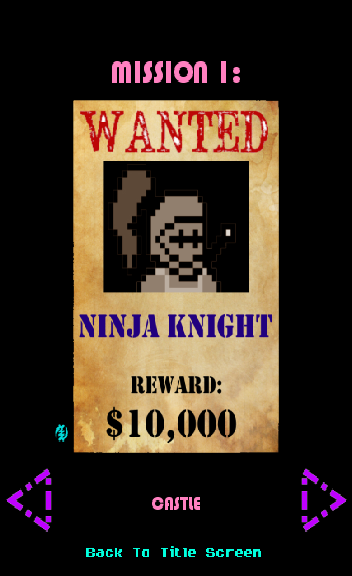 Play as Sky Nyame (pronounced YAHM-ME or N-YAH-MAY), a young upstart Ninja who is called upon to take on the notorious Ninja Posse, Led by the enigmatic, somewhat mysterious Mr.Shinobi! - Fun Action Bullet/Shuriken/Ninja Star Hell Shooter! - Colorful Retro Arcade Style Graphics! - Cool Synth/Electro/Hip Hop influenced Soundtrack! - Interesting, Humorous and Unique Characters! SoundCloud: Listen to the Official 'TRAP DAT NINJA' Soundtrack! Coming Soon for Purchase on iTunes and Google Play! Trap Dat Ninja: REMIX has been published to Google Play! Trap Dat Ninja: REMIX is now available to play Online!